There are several scale pests of Fraser fir in western North Carolina, elongate hemlock scale (EHS) and Cryptomeria scale being the major problems. Both are introduced pests and armored scales which make them harder to control. Because these pests are not native, their presence on cut trees may limit where they can be shipped. Pine needle scale is a native pest that is sometimes found, but has never been enough of a problem to warrant chemical controls. Scales can cause mottling of the foliage and needle drop. With Cryptomeria scale, both symptoms are severe and develop quickly. With EHS, symptoms are much less serious. However, the white filaments produced by the male EHS can make trees unsightly during harvest. Also, EHS is harder to control with pesticides than Cryptomeria scale. It truly requires an integrated pest management approach to control. The use of pesticides alone will not give satisfactory results. None of the following cultural controls will eliminate problems with EHS. However, they will help reduce problems with scales and reduce EHS rebound after treatment. When transplants are interplanted among older, scale infested trees, the scale will quickly move into younger trees. It is also harder to manage scales in uneven aged stands. By not interplanting, infested, problem trees are isolated from uninfested trees. Pests often become more of a problem if the host plant receives excessive nitrogen fertilizer. That nutrition translates into nutrition for the pest, allowing it to reproduce better and live longer. In Fraser fir Christmas trees, there appears to be a connection between EHS and nitrogen fertilizer especially. In fields with a strong clover component in the ground cover, factor in the nitrogen being provided naturally and consider reducing nitrogen use in younger trees. The EHS has many natural controls including lady beetles, dusty wings, and parasitic wasps. The use of broad spectrum insecticides such as Dimethoate and the synthetic pyrethroids (Asana, Astro, Sniper, Talstar, Wisdom) will kill these whenever applied during the growing season (April through October). Even though these products help control scale, their use can also allow EHS to rebound because the natural controls have also been killed out. Therefore, it is important to only use these broad spectrum materials when they are needed to control pests and to apply them with thorough coverage to get the best control possible. 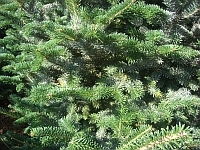 Aphid control requires the most use of insecticides in Fraser fir. Products such as Sivanto, Neem oil and Endeavor which have much less effect on natural controls should be considered in fields with heavy incidence of EHS. Sivanto in particular has proven effective against twig aphids when applied in the spring and Cinara aphids in the fall. Even the best controls will only kill about 95% of the scales. That means on heavily infested trees where there are 10 or more scales per needle and the majority of the needles are infested, there will still be enough live scales to perpetuate a problem. By cutting down and removing the most heavily infested trees, you will be removing a significant source of reinfestation. Cryptomeria scale especially produces a lot of crawlers in June and again in August. Crews that are shearing or tagging or otherwise walking through trees can carry crawlers to uninfested fields later that same day. Be sure to limit access of worker movement during times of peak crawler activity in Cryptomeria infested fields. When Cryptomeria scale is found in trees, prompt chemical control is warranted. Treatments are often quite successful, but scales may come back in 1-2 years. Be sure to keep scouting the newest growth to determine if reinfestation is occurring. Judging if EHS is bad enough to control is a more difficult decision. It is impossible to completely eliminate EHS from a field once trees are infested. In some cases, EHS has been present in fields at low levels for several years without getting worse. However, it is also easier and more effective to treat for scale in younger trees. The goal is to have only low levels of EHS in trees at harvest. To date, the best controls of EHS are either Talus, Safari, or a combination of either Sniper + Dimethoate or Asana + Dimethoate. Understand that even with the best treatments, 100% control of scale is not possible. The various windows for EHS are discussed along with the other pests that can be controlled with each product(s). Living scales can be found on 3 and 4 year old needles back in the canopy of the tree and even the systemic Safari performs best when applied with good coverage. Use a high pressure sprayer and create a mist that will move back to the underside of 3 and 4 year old needles. Mistlbower applications have typically not successfully controlled EHS. However, mistblower applications have kept EHS from spreading to other trees even when applied prior to bud break. For growers with limited acreage, a backpack mistblower is an effective way of applying materials for EHS control. In younger trees, trunk applications with Safari for EHS control may reduce scale incidence without affecting natural control and pollinators. 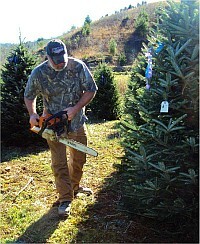 However, control of other pests of Fraser fir will still be necessary. This is the most effective time for treating scales because the most nymphs are present for both EHS and Cryptomeria scale. However, controls during this time will also have the most impact on natural controls. If you have RBM though, this is definitely the time-frame you should be looking at. TALUS:This insect growth regulator will only have activity against the immature stages of scales. The use of Talus will have the least impact on natural controls. DIMETHOATE alone: Will control RBM and BTA and will give partial control of EHS. If scales are not bad, this treatment may give enough control and keep scales from spreading. Dimethoate provides a knock-down of SSM and HRM. It will have less impact on natural controls than if Sniper or Asana are added and even though scale control will not be as good, in fields with a lower infestation level, this may be enough to get control when applied with adequate coverage. SNIPER + DIMETHOATE or ASANA + DIMETHOATE: Using one of these combinations will control RBM and BTA and will give better control of EHS, though it will also have a greater impact on natural controls. Dimethoate provides a knock-down of SSM and HRM. Sniper will provide good control of SSM. SAFARI — either foliage application or trunk application: Safari by itself will control EHS and BWA. This time frame should give the best scale control with this product. Control of these pests may take several months. A trunk application of Safari will also provide EHS control in younger trees. SAFARI + DIMETHOATE: Using this combination during shoot elongation will provide good control of both BWA and EHS without causing either SSM or HRM to become more of a problem. Safari control of BWA will take several weeks and EHS control may take several months. Dimethoate will control RBM and provide knock-down of SSM and HRM. When Dimethoate is applied in June, the BTA is killed before it has a chance to reproduce and lay the egg for next spring. Treating in the summer also gives good control of EHS. Deciding when in this treatment window to treat is difficult. Scale control is better earlier in the summer. The longer treatment is delayed into fall, the more likely scale control will be compromised because there are fewer immature scales. However, there are several good reasons for waiting. First of all, it’s usually cooler and easier to spray. Secondly, Cinara aphid control on trees going to market will be better and BTA control for the following spring will be better. SNIPER + DIMETHOATE or ASANA + DIMETHOATE: Using either of these combinations will control EHS (requires both materials) and BWA. EHS control through August is sufficient to virtually eliminate the white produced by the male and to keep males from developing in the home on cut trees. Both products should control Cinara aphids in market-size trees and reduce problems with BTA for the following year by reducing egg viability. Dimethoate also provides a knock-down of SSM and HRM. Sniper provides good control of SSM. Sniper used alone in harvested trees will reduce issues with the EHS male scale and crawlers emerging when marketed in warm climate. SAFARI: Safari used by itself will control EHS and BWA. EHS control through August is sufficient to virtually eliminate the white produced by the male and to keep males from developing in the home on cut trees. There will be no negative impacts on mites. Impacts on EHS natural controls are less than for other products and these impacts will continue to be reduced the longer in the season you wait to apply. Trunk applications of Safari should also work. SAFARI + SNIPER (or other bifenthrin product): Safari plus a bifenthrin product such as Sniper, Talstar or Wisdom will control EHS (from Safari), BWA (from both products), and BTA for the next spring, Cinara aphids and SSM (from Sniper). EHS control through August is sufficient to virtually eliminate the white produced by the male and to keep males from developing in the home on cut trees. The synthetic pyrethroids such as Sniper may make HRM worse the following spring, so be sure to keep scouting for mites. This risk is lessened the longer in the season you wait to apply. Prior to bud break may not result in as good scale control except for trunk applications with Safari. 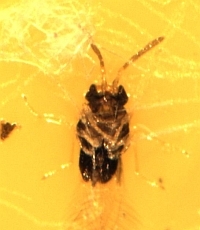 However, if twig aphid control is needed, it can provide a window of opportunity for some scale control which may be sufficient depending on results. SNIPER + DIMETHOATE or ASANA + DIMETHOATE: To successfully control scales in the spring, wait to as close to bud break as possible to allow as many crawlers to hatch as possible. These combinations will control BTA for this year, BWA, and will give a knock-down for SSM and HRM while Sniper gives good control of SSM. The synthetic pyrethroids may make HRM worse the following spring, so be sure to keep scouting for mites. SAFARI — either foliar application or trunk application: Safari by itself will only control scales and BWA. Control of EHS may be better with Safari during the June to early September treatment windows. However, this is the best time of year for trunk applications with Safari. SAFARI + DIMETHOATE: Adding Dimethoate to Safari will provide BTA control for the current year when applied before or even two weeks after bud break. The Dimethoate will also provide SSM and HRM knock-down. Long term control of these mites depends on many factors. SAFARI + SNIPER (or other bifenthrin product): Safari plus a bifenthrin product such as Sniper, Talstar or Wisdom will control scales, SSM, BWA, and BTA for the current year when applied before bud break. The synthetic pyrethroids such as Sniper may make HRM worse the following spring, so be sure to keep scouting for mites.